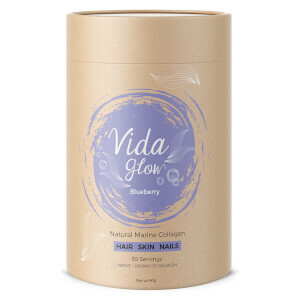 Boost the health of hair, skin and nails with the Vida Glow Collagen Supplement Sachets in Mango flavour. Containing pure Marine Collagen, the powdered supplement has been naturally sourced from Deep Sea Red Snapper and boasts a multitude of benefits, working to thicken hair, ease joint pains and reduce the appearance of fine lines and cellulite for firmer, younger-looking skin. This easy-to-take supplement helps combat this process from within, aiming to increase collagen levels as well as stimulate further natural reproduction, enhancing elasticity and hydration levels. The addition of Mango extract adds a delicious flavour, plus they’re rich in antioxidants, vitamins and minerals, providing a significant boost in Vitamin C, as well as Vitamin A, Vitamin B6, Vitamin E, Pectin, Phosphorus, Potassium and Magnesium into your diet. Collagen is much more easily absorbed and skin is left with a radiant glow. Provided in individual sachets, simply dilute in water as a daily supplement to your diet or mix it into your porridge, smoothies or yoghurt for a tasty twist. Suitable for up to three servings a day, you can expect skin, joints, hair and nails to gradually improve in condition and strength, appearing revitalised and rejuvenated. 100% Natural. Free from additives and preservatives. Take 1-3 servings each day, diluted in water or mixed into porridge, smoothies, juice or yoghurt.